It was in the early Nineties that I started reading Isaac Asimov. Goaded by lingering childhood urges, I picked up I, Robot, a collection of stories about evolution of robotics, sometimes supervised by Dr Susan Calvin, a phenomenal Robopsychologist, never to look back. The book is also famous for the Three Laws of Robotics, propounded in course of the stories that became the fulcrum of Asimov’s opus. I remained consumed by the evolution of robots into humaniform androids, calibrated expansion of humanity across galaxies and black holes, rise and fall of Empires and Foundations, progression of Psychohistory, cumulative human and alternate consciousness till I run out of his works. It was a chastening experience that left me with a vision of millennia, an answer to Life, much more expansive than the cryptic ‘42’ handed out by the other well known saga, A Hitchhiker’s Guide to Galaxy. Such was the influence of Asimov’s prophetic vision, I remained overwhelmed by the weight of the knowledge of what was to come for a million years. I was ready to stop anyone in his tracks and begin unloading my newly gained wisdom, not that many gave two hoots to what I thought. Most people had never read Asimov and the odd one who claimed to have read some book would smile wanly. Internet was yet to take over, and even though countless websites and bulletin boards spawned by the end of the Twentieth Century, I found none who shared my enthusiasm for Asimov, or science fiction for that matter. Master – your wish is my command and I am so glad I took time to read your post on Three realms of the mind! An amazing writer, indeed, and his philosophical musing is seldom recognised. That is sadly the case, Marina. He was a visionary who influenced a legion of authors and yet we have been deficient in credits to him. Nish, I have found his short stories exquisitely crafted. I am happy to learn you are also an avid reader of Asimov! US, That is such a nice and thorough review and presentation of the book. Though I have often read fantasy, science fiction I have never read – both as a matter of chance or the wrong books I laid my hand on. Your brilliant eulogy is definitely something that rakes up my interest in this genre ! Ash, as Atwood insists, her works are ‘speculative fiction’, implying her works are not far-fetched fantasies. Let me assure you, she is is addictive author. Many thanks for the praise. That’s nice blog you have pointed us to – and I am glad because it adds a good variety to reading and of course, this comes under a very enjoyable genre as well. The pleasure is mine, Abhra. Quite a coincidence, Uma, this post and my discussion. I will check out “Three Realms Of The Mind,” though I confess to not being a big fan of science fiction. I find enough “dystopia” in the present to satisfy my appetite for horror. Humans and Dystopia go hand in hand. You are going to like Atwood, Marty, if you don’t already. Umashankar, great post! I loved “I, Robot” too and was absorbed by Asimov’s futuristic ideas. I believe Isaac Asimov was one of those rare visionaries (much like Jules Verne in his time). As a matter of fact, I also preferred that book to “A Hitchhiker’s Guide to the Galaxy,” although I liked that one as well for different reasons. And like you, years ago I wanted to share my enthusiasm about Asimov’s vision with others but had very few people around me who read, let alone understood, Asimov. Fast forward to today, and many people are interested in that genre. Thank you for introducing us to the new blog, “Three Realms of the Mind,” I will be checking it out and look forward to reading your guest post! Madilyn, we are pilgrims of the same boat! Of all the science fiction I have read, Asimov’s is the most convincing. I am looking forward to rereading those books someday. 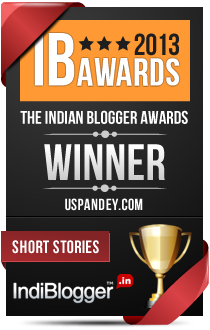 I am sure you are going to like Karthik’s blog. Sorry to admit I have just heard the name and that’s it. Was never interested in reading or writing anything even remotely related to sci-fi. I think I should start reading this genre as well. Now’s as good a time as any, Chinks. All the best! Uma, I’ve never read any Asimov, but “I Robot” sounds interesting. As a teenager, I listened to Alan Parsons Project’s “I Robot” quite a bit; maybe it was influenced by that. Great album, BTW. The only science fiction that I can remember reading was Ray Bradbury’s “The Illustrated Man.” That was in high school. With the recent popularity of tattooing, I’ve actually met several illustrated men. Kris, I’ve not read Illustrated Man but it is amusing to read how you remember the book seeing all those tattoo freaks. Someday in not too distant a future we may have our mobiles and other gadgets printed on our skin…. Thanks for the lovely introduction, USP and once again thanks for the post.